Let me start by saying this: There’s no fun way to have a baby. Natural, medicated, c-section, vaginal birth, home birth, they all have their pros and cons and it’s important to discuss your medical history and preferences with your doctor. This post is about my experience and my decision. After a lot of thought and research I’ve decided that I would like to try for a VBAC: vaginal birth after cesarean. I think a lot of people assume that once you’ve had a cesarean (c-section) that you have to continue to have them for your next pregnancies…but that is simply not the case for a lot of people. With my first child I did’t have a choice in the matter. I had to have a c-section because he was breech. And I did EVERYTHING I could to try and get him to flip to head down before my due date. Needless to say he never flipped and I was devastated. I remember crying in my doctor’s office when we realized baby wasn’t going to budge. I had to mourn the birth that I thought I would have. I wanted that experience with my husband. I wanted to work as a team to get the baby out. I wanted him to coach me and stand by my side. I felt confident and strong and wanted to have a vaginal birth…and it was all taken from me so fast. It took me several weeks to process everything and discuss c-sections with my doctor without crying (I know, hello hormones!). This time around I have my fingers crossed for a non-breech baby so that I can try for a vaginal birth. Currently in the United States more than 90% of women who had a prior cesarean have a repeat operation….an operation that they probably didn’t need to have, but were not educated about the VBAC option from their doctor. VBACs are associated with fewer complications, decreased maternal death, and a decreased risk of complications in future pregnancies. It is also major abdominal surgery that puts the mother and her baby at an increased risk of infection, hemorrhage, injury to other organs, anesthesia complications, and a maternal mortality two to four times greater than that for a vaginal birth (source). Even though I got to pick my c-section date and I knew exactly when I would be having a baby, nothing could mentally prepare me for what it was really like. My c-section with Hudson went perfectly…..except I was in a lot of pain afterwards. Being sliced open was not in my original plan and let me tell you this….it is no fun. It is not the “easy way out” that a lot of people think it is. A c-section is major surgery. I remember feeling extremely itchy all over thanks to the medication they gave me. I also couldn’t walk until the next day and had to have compressors on my legs that went off every minute. I didn’t sleep at all that first night and was basically miserable. I was in a lot of pain, had a lot of swelling, and I was itchy. To top it off I had a brand new baby to take care of! I couldn’t get out of bed so my husband changed all the diapers and brought our baby to me. It was a lot for him to take on as a first time dad too. After my c-section it has hard for me to walk without the fear of ripping open my scar. Going up and down the stairs was torture. I was sent home with a ton of pain medications that helped manage the pain but they put me in a fog for those first few weeks. I think it took me about 10 months to feel “normal” again, and to not constantly feel my incision. 1. My previous c-section was due to a breech baby, not failure to progress or baby getting stuck. 2. My incision is low transverse. 3. I’m healthy and of normal weight and height. 4. I didn’t have complications from my previous c-section. 5. My baby was average size (7 pounds 9 oz). There are risks associated with a VBAC, and I will be closely monitored when I am in labor to make sure I am safe and so is my baby. I feel confident in my decision. And I hope I at least get to try for a vaginal birth. But if I don’t, I’m not going to beat myself up about it. What matters in the end is that I have a healthy baby to love on. Any VBAC moms out there? I would love to hear your experience! That's awesome! I know alot of doctors refuse to even let you try to have a VBAC so it's great that yours will! Hope you get the birth you were hoping for this time! I am not one but my sister is. She had a c-section with her 2nd due to an emergency at 34 weeks. Her third was born via VBAC. 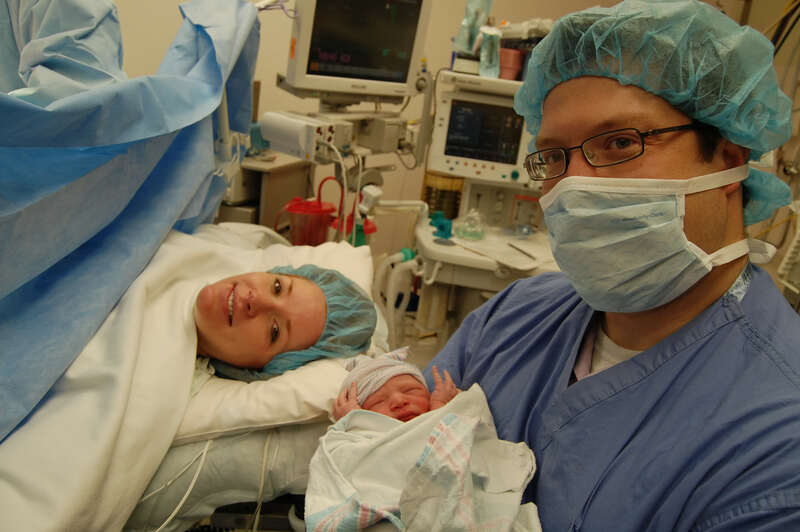 Though her doctor wouldnt give her pitocin to speed up the labor (hellow 36 hours) she was able to successfully deliver her third son vaginally. Two vaginal and one c-section and she recommends vaginal anyday of the week. Ultimately a healthy baby and mom are the goal but I wish her success with your VBAC. I cannot WAIT to see this little baby! I hope you get the birth you want this time around. Prayers and love <3! Good for you for standing up for what you want 🙂 VBACs are very safe if done properly and IN hospital, there are a lot of risks associated no matter how you choose to birth your child. I personally don't feel as though I was robbed the 'natural' birthing experience but I think it's because I didn't have a birth plan the first time around, all I knew is that I DIDN'T want a c-section. LOL boy way I naive. Next time around I will definitely have a repeat c-section, but only because my labor experience was AWFUL and long and Scarlett got stuck… I don't want that to happen again because recovering from a c-section is difficult but recovering from a c-section and day's of labor and hours of pushing was a whole other level of exhaustion. I too had a difficult time those first few weeks, being in a 'fog' is exactly how I felt. I hope that a scheduled section will be a little different…. it terrifies me though. How exciting! My mom has had two successful VBACS and cannot say good enough things about it! I pray that you get the opportunity & experience that you want!!!! My situation was exactly what yours was with Max and I successfully had my VBAC for Colette (#2)! I still had to choose my c-section date, but was able to schedule it way out like I could have put it at 40-41 weeks. Luckily I had her early and wasn't close to either of those days. It was a much different birthing experience that I LOVED. I felt the exact way you did after my c-section. Recovery was very tough on me for every reason you described and this was NOTHING like it. I walked to the bathroom 30 minutes after having the baby…. 30 MINUTES (ok, maybe it was an hour or so, but still). I 100% think you should try the VBAC. Either way you know what to expect with a c-section and if you get to try the VBAC you can enjoy that new experience. Let me know if you have any other questions. This is a great post and such honest feelings. I also had an emergency c-section with my first and was desperate for a VBAC but ended up having another emergency c-section for my second baby. Maybe for my third although the risks are really high again…?! Quick question – has your doctor said you can have an epidural with the VBAC or purely natural with no pain relief? Mine said I wasn't allowed the pain relief due to having to be able to feel any complications with the c-section incision… That is scary! Hi, I had a c-section, I actually chose a c-section over a vaginal birth to reduce risk to both me and my baby, but mostly because I was afraid to death of a vaginal birth. However I told my husband and doctors that I'm not opposed to a vbac if we have another baby. I'd like to try since my c-section went great and I was back to myself the next day, I feel like now I'm more mentally prepared for a vaginal birth. Hope everything goes well! You go girl! That is awesome you are planning a VBAC, you sound empowered and that's exactly how giving birth to a child should feel like! Good luck! Good luck!! I really wanted a vbac but I ended up getting pregnant only 7 months after my first c-section so my c-sections were going to be 16 months apart which is a lot less than the recommended 2 yrs between births if you want a vbac. My doctor supported me either way but in the end I decided to have a repeat c-section because my uterine rupture risks were doubled and the birth had to time out perfectly (no going over 40 weeks, no induction, not laboring longer than 6 hours) due to my short window. In the end I'm very happy with my decision because my doctor said my uterus was stretched really thin where my scar was and it was a high probability it would have ruptured. I just had a gut feeling but I think my situation is unique. I have a few friends who have had vbacs that have turned out perfectly!! It sounds like you're the perfect candidate and fingers crossed it all goes well so you get the birth you want! I will say my recovery the second time around was perfect, I was up walking around 6 hours after surgery and was off my pain meds in 4 days. Wow our stories are alike! My kiddos are 16 months apart as well and my uterus was stretched so think under the scar the doctor had residents come and look. She said if I had labored AT ALL it would've ruptured Yikes! 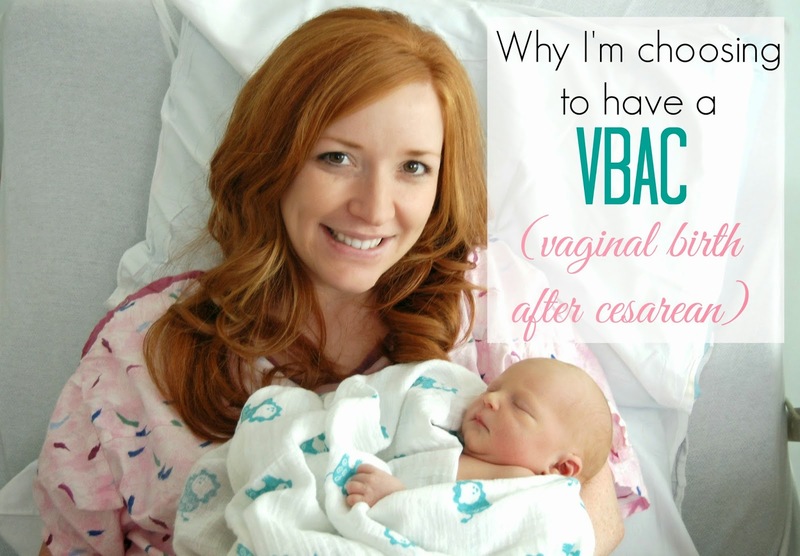 I had a VBAC with Harper and it was a great experience after a c-section. I was up and moving and feeling great. The best part was not having to deal with the surgery recovery and chasing a toddler and nursing a newborn. I would say having a supportive doctor is the number one thing. I had to really push for my delivery at the end. Good luck! I want to labor and try for a VbBAC with my second. First was an emergency C-section. Even if you end up with another cesarean, there are benefits to baby of actually being exposed to labor hormones and knowing that your baby is ready to come out. GL! Good for you! I hope you are able to have the birth you want! I was told I was a candidate for a VBAC but would not be able to be induced (as I was with Noah). Because of my history with HELLP Syndrome, I'm going to have a repeat c-section if I get pregnant again but I understand your desire! I love this! Id love to hear how your experience goes! My first was vaginal and second c-section due to her being breech. Id love to try VBAC when and if we have #3! So many people mentioned c-section as "the easy way" like you mentioned & that is simply not the case. Truth is there is no "easy" birth. I hope that you're able to have a natural delivery this time around! Will be praying for you & Baby R! Thank you for writing about this. You are always so informative and well spoken. My baby was breeched as well (csec at 39 weeks) and you were so kind when I emailed you for advice. I wish you all the best for a successful vbac! Such an informative and interesting post – I commend you for putting so much research and thought into this decision and working with your physician to make sure everyone is safe! Loved reading this perspective. I've had 3 c-sections (I couldn't dilate past 9cm after being in labor with my first son for 12 hours). Recovery from the first was rough, but got MUCH easier with each subsequent c-section – I was even vacuuming 3 days after my last one! Just know that if you do have to have a repeat C, chances are recovery will be easier than your first go round! Good luck and enjoy your new addition! This post is just what I needed right now. I am 28 weeks pregnant with baby #2. I had a very traumatic emergency C-section. I labored for almost 20 hours and pushed for 3 hours with vacuum at the end. He STILL didn't budge and I started getting a fever. He was 8 lbs. 6 oz. That experience still haunts me today. I gained about 60 lbs my last pregnancy which didn't help. I don't know if I'm a good candidate for a VBAC but this post was super helpful for making my decision. It's scary and I'm still on the fence about it. Sending you lots of love! Hope it all goes well. It's stressful no matter what since you never know how the delivery will go!! Very brave for sharing all of this with other women! Thank you for this post. I am right now torn about what to do as I want to try for a VBAC but it seems like everyone isn't for it. I really appreciated your opinion! Thank you again .